Health Fair Connections | How Can I Get More Health Fair Vendors and Exhibitors via HFC? HFC has over 7500 vendors in all the major metro markets across the nation, and if your health fair is one of those areas, you can find vendors & exhibitors for your event within minutes. However, if not in those areas or maybe you just want specific vendors that you already work with, you'll want to use the platform's invite features. They make it easy on managing vendors outside of the platform and getting them to register online...with little to no effort. 1) Upload an Excel file (csv. format) or copy/paste in the vendor invite section of your dashboard. It's easy to do; just make sure you follow instructions. This feature allows you to invite your carriers, EAP's, and any other vendor you work with or want to invite all at once. And, you can see below that you can either upload a list (.csv) or just copy/paste directly from the excel sheet into the white box. That's personally how I do it. As you can see above, you can upload an entire list and HFC's system will do the inviting for you. Those vendors invited will have a special link to register. You'll get to upload the list and sit back as we email you each time one of your vendors complete their registration. 2) Manually register vendors to your registration list. You will want to manually register a vendor say if a vendor with a previous relationship with you calls you on the phone and would like to be in the health fair. 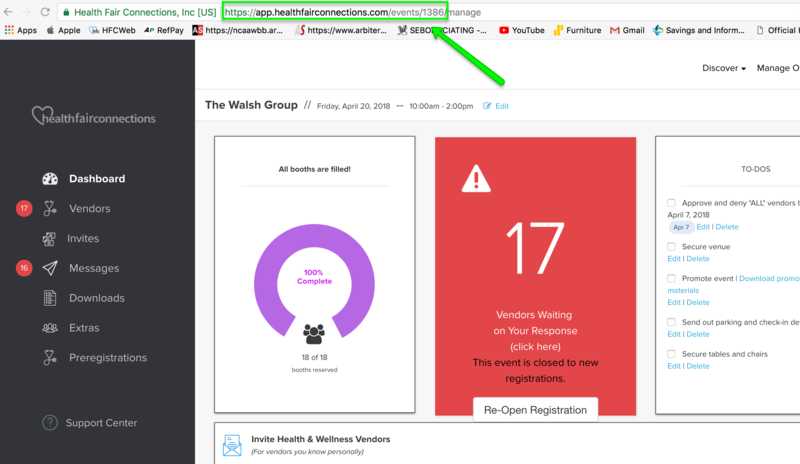 3) Email your employees and ask your employees to share the health fair link/page with their providers or health and wellness professionals they know. If you're really struggling to find vendors in your area, then this might be what you need to do to have a successful health fair. All you need to do is copy/paste the link into an email and share with your employees. They can give this link to their providers and any other types of vendors they have a relationship with and you might want to invite. Great thing is, the vendor still has to join the interested list and provide you info before making a decision; you still have full control. See an example below (and make sure you don't copy/paste the word "manage:"
We hope this post helps when it comes to finding more vendors & exhibitors for your health fair! If the health fair is unattractive to vendors, it will be hard to get vendors & exhibitors to want to attend.